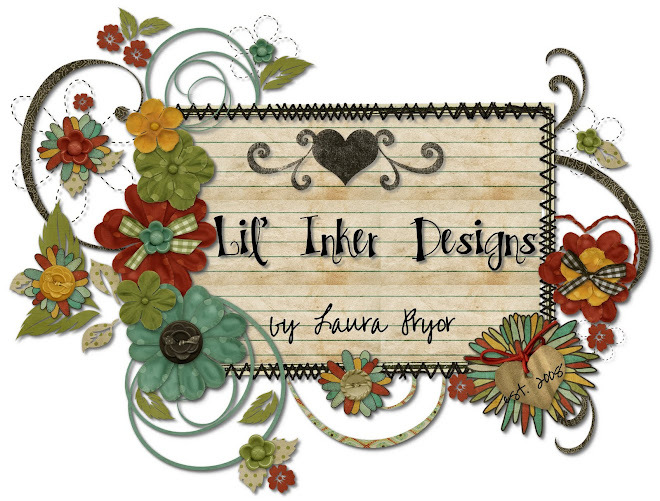 Lil' Inker: Flourishes FTTC106 - Happy Birthday! Flourishes FTTC106 - Happy Birthday! Hellooooo!! Before I begin, I just want to thank everyone who stopped by my blog and left a comment on last week's FTTC card. I am overwhelmed with joy to have received so many nice comments. Thank you so much!! I'm here for this week's addition of the Flourishes Timeless Tuesday Challenge, FTTC106. As soon as I saw that this week was a birthday challenge, I made a little note to myself to use the "Nurture Yourself" sentiment from the From the Garden stamp set. I also knew I wanted to go bright. Hopefully you are not needing sunglasses to read this post! These awesome, fun papers are from the Hippy Girl line from KaiserKraft. I colored this lovely From the Garden image in pinks and aquas and sort of built my layout around that focal image bit by bit. I also used a couple of the die cuts from the same paper pack which really helped to coordinate everything. I think it came together nicely with the addition of the green bow and orange button accent. I also added my sentiment to a little pink flag and I cut the end with my pinking sheers. I'm actually really happy with how this turned out now that I'm looking at it here. It's bright and fun and the sentiment really plays to a birthday theme! 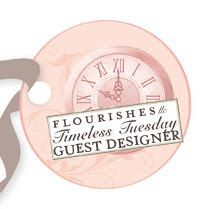 Sadly, this is my last week as February's Guest Designer for the Flourishes Timeless Tuesday Challenge. I can't begin to thank Tammy enough for having confidence enough in my work to ask me as the first Guest Designer in her position as coordinator. And I can't thank the lovelies of Flourishes enough for their generosity and for having me. It's also been amazing to be working alongside some of the most fabulous designers in the bizz AND receiving comments from them... Oh, Happy Day!! I truly feel like I've done some of my best work here at FTTC and I really think it IS because of how it challenged me to think differently. I am certainly NOT going to be a stranger here at Flourishes! 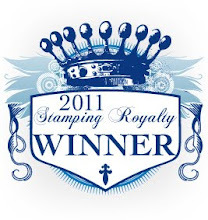 I started out a wee bit intimidated by the intricately designed stamps and I leave a true fan who is quickly learning how to use new products in a design style I feel confident in! And thank you to you for journeying over here, leaving wonderful and inspiring comments which make me so happy!! Please come play along! Visit the Flourishes Blog for all the details and info on how to! Beautiful and stunning birthday card Laura! Laura, this is DARLING! LOOOOVE the colors and the layout, and your coloring on the flowers is perfection! I'm SO glad to have had you for our first Timeless Tuesday month-long Guest!!! You rocked it all, girlfriend! GORGEOUS Laura, so happy to have you for our guest this month. Laura, this is super beautiful!! The bright colors are perfect for the theme! Love your pop of dots! I think your work is amazing and look forward to seeing more here at the Flourishes blog! What a fab biright and cheerful card thanks for sharing. I love yur inspiration of Nuture Yourself as a starting point. This is a zippy and fun card. Thanks for sharing. Beautiful creation! Thanks for the challenge! Cute card. Love the stitching and paper piercing. Such a cute card! It makes me happy with the bright colours. I like....! Beautiful card! I love those bright and fun colors. The DPs you chose are awesome! wow! this is gorgeous! love the fun, beautiful papers. this is really eye catching. congrats on the GDT gig. I love everything about this card! Thank you for sharing and thanks for inspiring me all february!